Co-sleeping is a frequent practice in many families, but it’s also a safety concern. In some forms, co-sleeping is a good thing: sharing a room with your little one is recommended by the American Academy of Pediatrics. It lets you monitor their sleep more closely and watch for dangers, which helps reduce the risk of SIDS. What’s not recommended is sharing a bed with your baby, especially when older siblings are in bed with you too. Sure, bed-sharing with babies is a common practice, and we certainly get enough comments from mothers who co-slept with all of their children and everything was just fine. Yes, that’s usually how it is. No one said that co-sleeping guaranteed SIDS. It just increases the odds, and needlessly! Just as putting your baby on his or her stomach to sleep, crib bumpers, or loose bedding, co-sleeping is something that puts your baby at risk and is completely preventable. 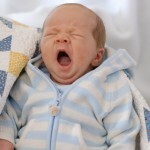 There are plenty of good reasons to begin transitioning your baby to sleep in the crib. 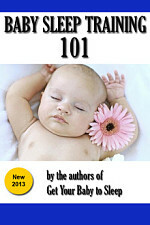 It gives your baby a safe place of his or her own to sleep, while helping you with baby sleep training techniques. It’s also less work and worry when it’s time for your little one to go to bed. One of the reason more parents don’t do it is that making this transition is difficult, especially when you’re still breastfeeding at night. 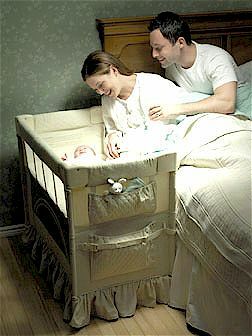 That’s where a co-sleeping crib, such as the Arm’s Reach Bassinet, can be invaluable. The key innovation in co-sleeping beds is that they’re separate from your bed. Wheels on one end to move easily around the house. Safe place for baby to sleep next to bed. The Arm’s Reach Co-sleeper Mini Bassinet is designed for keeping your baby close to your bed, but in his or her safe little space. It attaches securely to any adult bed (size twin all the way to California king) just under the mattress. That way, you’ll have your baby right next to you for comfort and closeness.The mini bassinet is easy to assemble and comes with a decorative liner to keep your baby cozy. 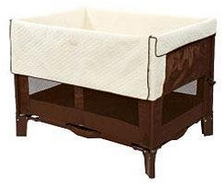 The bottom is ventilated to prevent your baby from getting too warm. 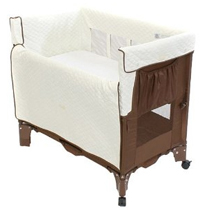 It’s also portable enough to be used as a little baby play yard, safe from pets or anything on the floor.Portability is one of the best features of this bassinet – it’s wheeled on one side for moving around the house, and also comes with a case so that you can fold it up for travel (weighs only 25 pounds). Thus, it’s great to take on trips or to the grandparents’ house for a weekend. If you’re currently cosleeping with your baby (letting him or her sleep in bed with you), you should really think about this product. 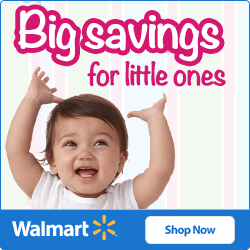 It provides all of the closeness and convenience of having your baby next to you in bed, but gives them a safe little spot to fall asleep in.